Salafi politics has taken Egypt by storm. This has surprised many commentators who underestimated their base of thought and non-political nature. For others, it has been a validation of years of Salafi work in mosques and surrounding communities to preach Islam and help the poor. As an aid to understanding this phenomenon, and in effort to understand it myself, this text will function as an inverted pyramid. It will start with broad strokes concerning the Salafi coalition in Egypt – the Nour Party, focus on one member in particular – the Asala Party, demonstrate their base in a typical neighborhood – Warraq, and then feature one member in particular – Essam al-Sharif. Appreciation is given for his help in gathering the story which follows. For a historical background to Salafism in Egypt, click here for a previous post. Though lines overlap, Salafis can be distinguished from Muslim Brothers and Islamic revolutionaries based on methodology, rather than thought. All three groups desire some sort of an Islamic state in which sharia law is the basis of governance. After a history of struggle against the state, the Muslim Brotherhood foreswore violence and sought to transform society while seeking entrance into the political arena. Believing the Brotherhood to have betrayed the jihadist struggle, revolutionary groups such as al-Jama’a al-Islamiya continued to agitate against the state, seeking its overthrow. Salafis, meanwhile, are understood to be quietist. They eschewed political participation, with some, perhaps many, declaring it to be heretical to Islamic law. At the same time their theology called for obedience to a Muslim ruler. Unlike many in the revolutionary groups, Salafis accepted the broad, liberal, and traditional interpretation of ‘Muslim ruler’, accepting Mubarak as having been given by God. Therefore, while the state pounded revolutionary Islamic groups out of existence in the 1990s and early 2000s, and placed countless political obstacles and jail terms in the path of the Muslim Brotherhood, Mubarak generally allowed Salafis free reign to propagate their religious interpretations. While strict limits were enforced, Salafi preaching proliferated in the mosques of lower class areas as well as on popular satellite television channels. Rumors are rife concerning extensive financial support from conservative Gulf nations, but the result was the emergence – below the attention of middle class society and politics – of an authentic Egyptian Salafi movement. Conventional wisdom states given their unique situation in the Egyptian scene, Salafis did not join the revolution of January 25. By and large this is true; many of their leaders declared such activity as religiously haram. Yet many Salafis did participate. This is the testimony of Hani Fawzi, a political activist from Helwan and party leader for the Salafi Asala Party in Nasr City, Cairo. He joined the demonstrations on January 28, as did a few of his favored Salafi sheikhs, such as Nashat Ahmad, Hassan Abu al-Ishbal, Fawzi al-Sayyid, and lastly Mohamed Abdel Maqsoud Afifi, who will be mentioned later. Nevertheless, upon the success of the revolution and the opening of the political scene, most were surprised to see the enthusiastic participation of newly formed Salafi parties. This was accompanied by much internal discord. Some continued to criticize political participation, and those who formed parties witnessed several divisions and splits. In the end, two main groupings emerged. The first and largest issued from Alexandria, understood to be the greatest base of Salafi strength. Leaders there created the Nour (Light) Party. Meanwhile in Cairo, the Asala (Origin) Party was formed. Other parties also emerged, but did not come to national prominence. Nour and Asala were not true rivals, however. One Salafi stated the reason to have more than one party was pragmatic. If any difficulties were encountered by one party – political, legal, administrative – the other one could assure representation. Over the summer Egypt’s political powers negotiated alliances as the Muslim Brotherhood’s Freedom and Justice Party seized the place of initiative. They created the ‘Democratic Alliance’, seeking as broad a coalition as possible. 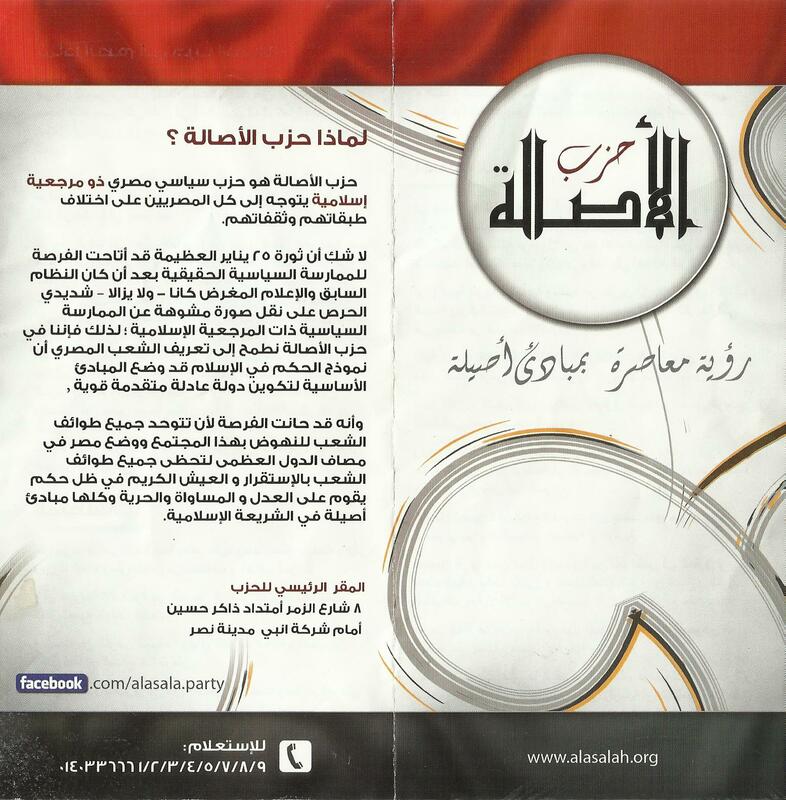 The historic liberal party, the Wafd, joined them, as did the newly created Salafi entities. Newer liberal parties rejected the central place of the Brotherhood and doubted their democratic credentials. The Free Egyptians and the Social Democratic Party allied instead with the youth revolutionary parties, setting up a liberal vs. Islamist electoral battle. Yet further splintering emerged. The revolutionary parties split from what became known as the Egyptian Bloc, largely over issues of representation and nomination of members. Meanwhile, the Wafd Party decided the Brotherhood-dominated Democratic Alliance did not fit with its liberal heritage, and decided to go it alone in elections. The surprise came when the Salafis later split from the Brotherhood, although the reason is similar to that which dissolved the Egyptian Bloc. Egypt’s electoral system created a two-thirds ‘party list’ and a one-third ‘individual’ competition for seats. In the party list system, a slate of candidates would be presented, to be voted on as a whole. The number of candidates elected would correspond to the percentage of the vote captured by the list within a particular district. For individual seats, only one person could be nominated and receive support from the coalition. In the Egyptian Bloc, youthful revolutionaries and established middle-class professionals vied for positioning at the top of the list, and for nomination in individual elections. When the youth felt they were being marginalized, they formed their own coalition. It should be mentioned additionally that leftist-liberal orientation played a role in their division, though it did not take down the alliance. The remaining Free Egyptian Party (right of center economically) and Social Democratic Party (left of center) held together in support of a liberal political system, and perhaps in opposition to Islamist trends. The story is similar for the Democratic Alliance. The largely middle-class and politically established Muslim Brotherhood clashed with the lower-class and populist Salafis over representation in the coalition. It should be mentioned additionally that moderate-conservative orientation also played a role. Yet rather than this designation, it might be more true to label the conflict as pragmatic versus idealistic. In any case, the Salafi parties left and created a coalition under the name of their dominant partner, the Nour Party. This coalition included the Reform and Development Party, created since the revolution by al-Jama’a al-Islamiya, the former Islamic revolutionaries. After being greatly weakened by the state, the group controversially foreswore violence in the late 1990s. Laboring internally over their identity and purpose, al-Jama’a maintained a base of support in Upper Egypt, and allied with the Salafis during the elections. The other partner with Nour is the aforementioned Asala Party, to which the rest of this essay will turn. This largely geographical alliance – Alexandria, Cairo, Upper Egypt – gave the Salafis a national base of support, allowing each partner to draw from their positions of strength. The result has been a solid 25% of the national vote. The Muslim Brotherhood drew support from many Egyptians for its role as major opposition party to Mubarak, as well as a lack of alternatives, and not necessarily from its Islamist politics. Salafis, meanwhile, drew only from their base and their religious-identity based campaign strategy, suggesting their representation does indeed encompass one in four Egyptians. Yet before moving on in complete acceptance of this fact, it is suspected by many the Salafis also received the benefit of official fraud. If this accusation is true, it does not necessarily imply their complicity. Rather, it is maintained the ‘old regime’ remnants in the state wish to prop up the Salafis for one of two reasons. First, given their political acquiescence to the stability of order, otherwise non-Salafi political apparatchiks and business interests believe they can rule through the Salafis and maintain a Mubarak-style regime. They would allow Salafis to institute a more conservative social order, but themselves exist outside of its reach. The assumed political naiveté of Salafis would also allow the same level of corruption in administration and policing. The second reason proposed for state-sponsorship of the Salafis is that they are meant as a counter-balance to the Muslim Brotherhood. It is maintained the Brotherhood could not be denied leadership in the post-revolutionary order, but they are pragmatic enough to play political games. Mubarak scared the West by saying support me, or face the Brotherhood. Old regime members can now make back-door deals with the pro-business Brotherhood to say, support us, or face the Salafis. Meanwhile, to keep the Brotherhood honest, the old regime can threaten them with the populist Salafis, who can ‘out-Islam them’ if push comes to shove, especially if the state greases the wheels of low-level electoral fraud. Either way, it is a dangerous game, but many liberals believe it is being played, if only from sour grapes. Shifting focus to the Asala Party in particular, it is interesting to note it was not the first Salafi Party formed in Cairo. This honor goes to the Fadila (Virtue) Party. According to reports, the co-founder of the Fadila Party, Khaled al-Said, had disagreements with elected chairman Adel Abdel Maqsoud Afifi, resulting in the parting of their ways. The latter then went on to found the Asala Party. Afifi had been a general in the police force and the director of the Passports and Immigration Control section of the Interior Ministry. He is also noteworthy for being the brother of the celebrated Salafi television preacher Mohamed Abdel Maqsoud Afifi, who also served as a government chemist. His Egyptian ministry is based in Shubra, a neighborhood in the north of Cairo. Afifi was elected president of the party, which he co-founded with Ehab Shiha, an engineer who owns a mid-level building company. Shiha is vice-president of the party, along with Mamdouh Ismail, a lawyer renowned for handing the defense of Islamist clients, especially from al-Jama’a al-Islamiya. The Asala Party literature declares it to possess ‘a contemporary vision of original principles’. This vision consists of six founding principles which influence eight goals in particular. Islamic sharia law is the principle source for legislation, which guarantees justice for all denominations of the people. The national benefit will be promoted through the search for professionals of high capability and sincerity to work in government. The Egyptian people have the right to personal freedom of expression, and the Egyptian citizens must have their respect and dignity protected. The Egyptian people have the right to chose their representatives in both legislative councils and executive bodies. Elected representatives are chosen by the people to express their viewpoints, not to be considered better than them. The ruling authorities – president of the republic and the cabinet ministers – are employees who work for the good of the people, who have the right to question, hold accountable, and judge them if they perform poorly. Intellectual, social, and moral development through purifying souls and the elevation of traditional values drawn from Islamic sharia law. Complete economic renaissance in all sectors of the state resulting in an increase in GDP through ideal use of national resources. Just distribution of wealth and lessening the class divisions to improve the social situation of the general Egyptian people. Preserving the dignity of the Egyptian citizen, whether inside or outside of Egypt, without looking to his social position, as the simple citizen is the primary member of society. Complete improvement in social services necessary for the public, including educational, health, and security. Establishing the foundation of justice and equality between citizens in their rights and the rule of law, through implementing Article Two of the constitution to ensure the regulations of Islamic sharia are the true and veritable primary source of legislation. Crafting strong relations with neighboring countries, especially of the Nile Basin to preserve the interests of Egypt both domestically and internationally. The return of Egypt to her position of leadership in the region, in Africa, and among Islamic nations, as deserving of her history, civilization, and the potential of her great people. The Asala Party then went about the work of building party infrastructure. They chose Essam al-Sharif as party secretary for Warraq, a neighborhood in north-west Cairo. Warraq is a mixed industrial-agricultural area, lower class, with Christians populating in general accordance to their national percentage. There are several churches, one of which is alleged to have received an appearance of the Virgin Mary in December 2009. The name of the area is derived from the Arabic for ‘maker of paper’. As such, it hosted papyrus manufacture from ancient days as well as the first modern printing press in Egypt. It is also well known for production of women’s Islamic dress. During elections, Warraq constituted a district along with the neighboring areas of Awseem and Manashi. The district was allotted ten seats for party-list competition. The Muslim Brotherhood backed Freedom and Justice Party captured 40% of the vote, while the Nour Party alliance received 30%, capturing three seats. Two of these three – Adel Azayzi and Abu Khadra – are from the Nour Party proper, while the third – Nazzar Ghurab – represented the Reform and Development Party of al-Jama’a al-Islamiya. The Asala Party did not field a candidate in this district, but campaigned for its partners all the same. The campaign for individual candidates followed national law to vote for one seat for ‘professionals’, and another for ‘workers/farmers’. This peculiarity is a holdover from Nasser-era elections designed to assure better representation for the working class in his socialist system. Over a hundred candidates campaigned, but only a few had enough prominence to secure victory. One major issue for parties was the dominance of Mubarak’s National Party in all constituencies of Egypt. This did not concern the professionals’ seat, in which Mahmoud Amer of the Freedom and Justice Party defeated Emad al-Halabi from Nour in the run-off election. This was a friendly competition in which the two candidates shook hands after the final result was declared. On the street however, the FJP candidate received the vote of a Salafi partisan, angering some within Asala. Many commentators expect a replication in the years to come. The Muslim Brotherhood and the Salafis are ideologically similar, yet competition often brings out the worst in men, even among friends. Yet the problems of candidacy with the old regime National Party complicated the workers’/farmers’ election. Newer parties were under pressure not to nominate any Mubarak era figures, but this eliminated so many potential candidates. In the end, both the FJP and the Nour Party selected individuals, but their applications were rejected legally for not meeting worker/farmer qualifications. As such, Islamist forces failed to feature a candidate for this Warraq slot. Even so, they represented a major voting constituency, desired by other candidates. In the initial election neither the FJP nor the Salafis endorsed a candidate. The run-off resulted in the easy victory of Mustafa Sulman, an independent candidate, over Yusuf Khalid of the Egyptian Bloc. Sharif explained both candidates had ties to the National Party, though neither occupied significant leadership. To play in politics under Mubarak meant getting your hands dirty in the party; Sharif believed Khalid’s hands were dirtier. Islamists threw their weight behind Sulman in the run-off, which was decisive. One of the more prominent campaign tactics of the Nour Party coalition was widely criticized by other parties. Outside the party headquarters of Asala a pickup truck would arrive several times weekly, stocked with gas bottles. These are needed by the majority of residents as the state does not provide independent gas lines into each home. Due to a purported shortage in supply the black market drove up rates, yet the Asala Party sold each at the designated government price. It was assumed there was either money from the Gulf funding this program, or else government corruption to facilitate it. Sharif explained there was indeed corruption, but that the Asala Party was combating it. The offices of the local governor would authorize certain people as agents, sell them bottles for 3LE ($0.50 US), and allow them to resell at 5LE ($0.80 US). Instead, due to shortages, bottles were being sold for as much as 20-25LE ($3.25 – $4 US). In many parts of Egypt there were protests over these shortages, with the poor bearing the brunt of others’ profit. The Nour Party coalition went to the governor and threatened to bring him up on charges of corruption if this process did not cease. They then arranged directly with the agent at the point of loading, paying him his due price, and directing the pick-up truck to party neighborhoods in each district. There, to gathered crowds, party coordinators would sell the bottles at price, plus 1LE markup for transportation. According to Sharif, there was neither profit nor expense for the party. There was, however, great popular acclaim. When one recipient entered the party offices and asked who to vote for, Sharif stated (at least in the presence of the author), ‘Whoever you want.’ Upon insistence, he said the Nour Party is good. Asked about the Brotherhood, he said they were good also. This program could have been done by any party, Sharif explained, but the success of the Salafis stems from their connection to the people. Sharif is a son of Warraq; he is a local businessman who owns a coffee bean shop. He is not wealthy, but is able to travel to Sudan on business to import supplies. Furthermore, he works for the Asala Party on a volunteer basis. He believes in his principles, and sacrifices for them. As an example of sacrifice, connection to the people, but not fanaticism to the party, Sharif offered his intervention on behalf of his Christian neighbor. Shadia Bushra is a 45 year old widow, living in an apartment complex owned by her extended family. When her aunt decided to move to a more affluent quarter, she attempted to sell the building. Shadia, however, refused to leave. She was paying 10LE ($1.80 US) monthly rent for years, and a now grandfathered housing law dictated the freezing of the original rental contract. If Shadia moved she would have to find a new apartment at current market prices, which would overwhelm her and her three children. Shadia earned around 300LE ($55 US) per month working in a local nursery, and received a 120LE ($20 US) monthly stipend from the government as a widow. Shadia’s aunt could have sold the building without forcing the move, but this would have resulted in a lower sale price, as the new owner would be legally obligated to honor the original rental agreement. Shadia, however, had long lost the original contract, and her aunt decided to take her to court. Having been neighbors for many years, Sharif helped Shadia when the priest in the local church took the side of the wealthy relatives. He went with her multiple times to the court, and bore witness she was a long standing resident of the apartment. The judge ruled in her favor, and she is now the sole resident in an empty apartment building. Shadia asked Sherif if he would have helped her had the litigant been a Muslim. Sherif answered he only became involved because she bore the side of right, and was acting on behalf of a neighbor. Shadia wound up voting for the Freedom and Justice Party of the Muslim Brotherhood, following the general word on the street. She gave no indication Sherif influenced her to vote in any direction. Egypt is learning the ways of democracy, yet within a historic struggle for power. Part of the acclaim of Islamist parties is they represent a departure from the ways of corruption in the former regime, bound, as they are, by the moral strictures of Islam. Whether they will prove incorruptible is subject to much doubt, and though Sharif’s explanation of the gas bottle campaigning is reasonable, it also seems to skirt the line of the acceptable. Yet Sharif displays a magnanimity and sincerity bearing well on his party. Its principles and goals may be another matter, requiring further analysis. Whether or not an open-minded, reasonable personality like Sharif is representative of his party is yet another question. To what degree are Salafis other-rejecting extremists, and to what degree are they simply portrayed this way in liberal propaganda, which has rarely descended to learn from or benefit the street? Answers to these questions will require the wisdom of the years to come, yet requires immediate action in electoral decisions. Salafis are part and parcel of Egypt; their place is demanded in representation. How Egyptians decide – or are manipulated – is subject to debate; this small window into their world is offered simply as a means to understanding.